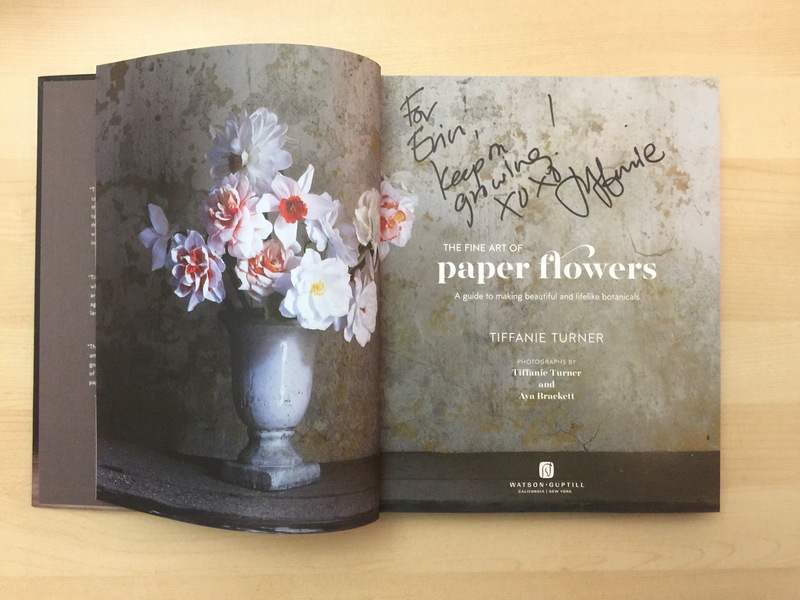 Tiffany Turner, paper flower extraordinaire, released a paper flower book and it is gorgeous! Hard cover, beautiful photography, and all of them flower how-tos and tips! Tiffany recently spoke in Walnut Creek as part of her book tour so I got to listen to her share her story and process. She makes realistic paper flowers and larger than life paper flowers (so we can experience them zoomed in and close up!). I like how she pays attention to the imperfections from her flower specimens to create a perfect paper flower. They really do look more real when they have imperfections — a fallen or bent petal is the perfect touch. Tiffany did a quick poppy demo after her talk, and then I got to meet her and admire the paper flower display she brought to share. Flowers!!! Of paper!! They look so real. I’m super excited to add this book to my collection, and to attempt making some of the flowers in the book. Tiffany includes suggestions on what materials to use for each project, and she even includes some of her favorite places to purchase supplies. I really want to start with the echinecea tutorial. What kinds of book signings do you like to attend? Share below!